The ABC and BBC Worldwide present a Doctor Who exhibition at ABC Ultimo, Sydney, from August 2013 to January 2014. We append the press release. We will be on Peter Goers 891 Local ABC Radio from 8:45pm tonight. Richard Matheson has died at the age of 87. ABC loses BBC content, saves Doctor Who! Breaking news: BBC will not renew its output deal with ABC from 30 June 2014, new programming will not be guaranteed to be offered to the ABC first. We are happy to announce a Doctor Who themed show. A demonstration of the polyglot nature of the TARDIS telepathic circuits? Or a clip from the television sales fair BBC Showcase 2013? Thanks to BBC Worldwide for sending us this link! 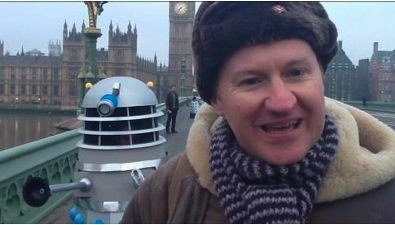 The BBC has sent us some behind the scenes footage of Mark Gatiss filming An Adventure in Space and Time. Gerry Anderson has died at the age of 83. Harry Harrison has died at the age of 87. Ray Bradbury has died at the age of 91. We've received reports that the Mark Sheppard event has been cancelled. Doctor Who fans are invited to two exciting events! British director Ken Russell has died at 84. The BBC plans a convention for Doctor Who in Cardiff, March 2012. We'll be on FIVEaa 1395, 3pm today. We'll make a radio appearence on Evenings with Peter Goers, after 20:00 today, ABC 891. Better known to Doctor Who fans as Manuel Alvarado, the co-author of Doctor Who: The Unfolding Text (1983) (with John Tulloch). The 2011 AGM has given the club a new committee. Additionally, SFSA 28 is distributing. Part of a total lunar eclipse will be visible from Adelaide from 8.31pm Tuesday 21 December 2010. ABC serves up a double Doctor Who treat for fans on Boxing Day. BBC Worldwide and Yahoo offer Doctor Who online. We are pleased to announce a competition to celebrate the anniversary of the club's foundation in 1980. The ABC will repeat The Goodies. Channel TEN has moved an episode of K-9. Doctor Who came eleventh for Sunday the 19th of April, with over a million viewers across the nation, some hundred thousand in Adelaide. This is quite good for both ABC in general and Doctor Who specifically. Until you see all three Biggest Loser "programmes" scored more. Club appearance on ABC Radio Far North Queensland, 16.30 CDT/QST Monday 23 November 2009. The 46th anniversary will be a topic. Multiple news sources are running stories about Barry Letts' death from cancer today, at age 84. Actor Ray Barrett has died in hospital aged 82. In a shock result, tweets emanating from the Anticipation Worldcon in Montreal reveal Doctor Who has lost the Dramatic Presentation, Short Form Hugo to Doctor Horrible's Sing-A-Long Blog. The club has a spot on community noticeboard with Ashley Walsh, ABC radio 891 tomorrow morning (Saturday July 18 approx. 6.30am). Apologies to anyone trying to access this site for the past few hours. There was a software problem which refused to go away until I sacrificed a goat and held my tongue exactly the right way, aligned to Venus and mars and pointing West instead of East which really confused me. All said and done, it's fixed and sorry again for the inconvenience. Steve Roberts has announced he is closing the Restoration Team Forum as of April 1 2009 <http://www.rtforum.co.uk/>. The Restoration Team site proper will continue. Beatrice Arthur is reported to have died peacefully at home from cancer today. The Star Trek actress and widow of Gene Roddenberry died at home on December 18, 2008 from complications arising from leukemia. She was 76. For those of you who haven't noticed, the website has been upgraded (slightly). Musician, actor, Grammy and Academy Award winner Isaac Hayes has died of an apparent heart attack. For those saddened take solace that his soul will live on, possibly possessing humans, causing trauma, or returning to Xenu, ruler of the Galactic Confederacy. The pub meeting for August will be from 5pm on Saturday the 2nd at the Buckingham Arms Hotel, Walkerville. The August general meeting will be at Adelaide High School from 3pm on August 16. Doctor Who Photoshoot and community mural! Or you will be exter-min-ated! Russell T Davies has been made an Officer of the Most Excellent Order of the British Empire for services to drama. Robert H Justman died on May 28, 2008 of complications arising from Parkinson's Disease. Blackwood Library is hosting a special Fantasy night. John Phillip Law, prince of bad sixties SF movies, passed away on May 13, 2008. Alexander Courage, composer of the Star Trek theme, passed away on May 15, 2008. Musician and composer Tristram Cary passed away in Adelaide on the 24th April 2008. 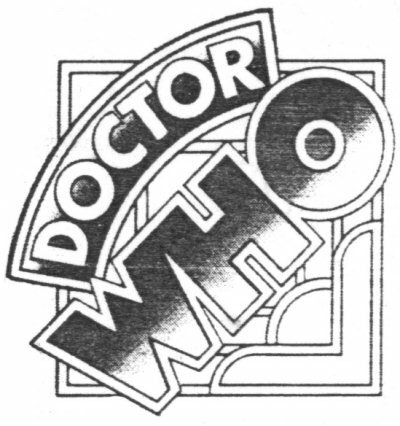 Mr Cary was interviewed by SFSA about his career and particularly his siginificant contribution to Doctor Who for Chameleon Factor several issues ago. I'm sure we all would pass on our sincere condolences to his friends and family. We are sorry to announce the passing of three time Doctor Who script writer Johnny Byrne on the third of April 2008. Charlton Heston is no more. The most (mis)quoted character from planet of the apes has passed on to the great rifle range in the sky. Now I'm sure someone will pry his gun from his cold dead hands. I am further saddened to announce the death of Barry Morse, who played Professor Victor Bergman in the first series of Space 1999. I am sorry to announce the death of Steve Gerber on February 10, 2008. The creator of Wundarr the Aquarian, Omega the Unknown and Foolkiller, Gerber lost a lawsuit with Marvel over his character Howard the Duck. I usually write a more comprehensive obituary but I'm annoyed and distressed over how little publicity this has gotten locally. Here's <http://www.newsfromme.com/archives/2008_02_11.html> a much better one by Mark Evanier, who's also taken over Gerber's blog to append more as it occurs. Alice Spring based station Imparja has confirmed its dropping of Ten programming in favour of Nine will include the Doctor Who spin off, Torchwood. Select news sources are reporting the death of Maila Nurmi . The field of historical fiction took a blow on Wednesday with the death of George McDonald Fraser. The 2007 Doctor Who Christmas special featuring Kylie Minogue on the Titanic was narrowly beaten in the ratings by the incestuous antics in Eastenders' Albert Square. Author and anthology editor Peter Haining died of a heart attack on November 19th, 2007. Doctor Who's first producer passed away on Thursday, November 22nd 2007. Documentary with some Doctor Who content, ABC-TV, 10pm Tuesday 18 September 2007. Recommended viewing. The SFSA general meeting for August 2007 will be from 15;00 tomorrow (the 18th) at Adelaide High. Be aware this will be starting at THREE PM, especially those of you who can't read 24 hour time. Sylvester McCoy will be the guest at the Doctor Who Club of Victoria's Whoniverse 2007. Horizon has announced the death of Peter Tuddenham on Monday July 9 2007. Ratings information shows ABC and TEN are enjoying high Who audiences. TEN's latest press release continues the network's promotion of Torchwood. The first club event for 2007--2008 will be a pub meeting at the Buckingham Arms hotel, Walkerville, from 17.00 on the 7th of July. The club will have an appearance on radio on Wednesday the 27th of June 2007. Network TEN have claimed a win with Torchwood debut. The schedule for Doctor Who and Torchwood shows July 2007 to be the most Who packed month since daily repeats ended in 1994. Mentions of Doctor Who in the press are picking up with the premieres of Torchwood next Monday (June 18) and The Runaway Bride (June 28). Doctor Who researchers are looking for any viewers who saw Doctor Who in Singapore in the 1960s or '70s. After only eight episodes broadcast, and a month before her debut in Australia, various news sources are claiming Freema Agyeman has not had her contract renewed for a second year. The Australian Broadcasting Corporation has scheduled both The Runaway Bride and series three of Doctor Who. NASA has reported this morning the death of astronaut Walter Marty Schirra, Jr.
Actor Barry Nelson, who played James Bond in an adaption of Casino Royale for a 1954 episode of the anthology series Climax! has died at age 89. The BBC announced the death of Dave Martin on April 12 2007. Southern Cross Ten, a regional broadcaster affiliated with Network TEN have confirmed they will be broadcasting Torchwood from the TEN feed. It's finally happened. My old-faithful server (having seen just shy of 7 years faithful service) has passed on. It's kicked the bucket and shuffled of this mortal coil. It's <expletive deleted> snuffed it. So I've spent the past 24 hours trying desperately to get my shiny new server installed and up to spec in record time. And now here it is. The Australian Broadcasting Corporation has confirmed today that they have decided not to purchase Torchwood. SFSA wishes you a happy new year and many more to come. Doctor Who and Tomorrow People author Craig Hinton has passed away. You may ask yourself what the <expletive deleted> happened here? Well asking won't get you much more on an answer than "I was bored". Robert Altman passed away at his Los Angeles home on Novemember 20 2006. He was 81. The call center television advertisement showing how poor robots function in this capacity has returned. The Daleks have been edited out as the BBC had licensed them for one year only. Doctor Who has won three National Television Awards in the UK: Best Drama, Best Actor (David Tennant) and Best Actress (Billie Piper). As these awards are publicly voted for, and open to overseas product, this indicates the show is a mainstream success. Yup, stupidity on my part. I was attempting to update the database for the new site and stuffed up the database on this one. Luckily I only wiped out everyone's passwords, but I got them all back so no harm done. People who had trouble logging in today will be pleased to see that they can login now. James, Stephen and Martin will be on ABC Radio 891 at 1:45pm, Wednesday the 4th of October 2006. Host Carole Whitlock. Julie Gardner, Head of Drama BBC Wales, has been given the additional job of Head of Drama Commissioning. We are sorry to announce the death of Peter Ling, one of the most prolific scriptwriters of all time, and author of Doctor Who: The Mind Robber. Norwegian police have announced the recovery of Edvard Munch paintings stolen in 2004, including The Scream. They have declined to describe any of the circumstances leading to the return. News of the painting's theft featured in The Wall of Lies 90. The BBC has announced the death of David Maloney on the 18th of July 2006. He directed some 46 episodes of Doctor Who, produced the first two seasons of Blakes 7 and the BBC adaption of The Day of the Triffids. In detailed ratings information, Doctor Who: The Christmas Invasion won its time slot against all except the mighty ovoid ball, earning itself 48th highest ratings for the week! Club members James and Martin will be interviewed by Peter Goers on local ABC radio 891 from 20.00 on Tuesday evening. The initial overnight ratings for The Christmas Invasion place it at 1.03 million viewers, slightly less than the series one debut episode (Rose) in May 2005. A more detailed breakdown will be available later. As of 23 June 2006 season five is being repeated at 6 am Friday mornings. Neal Powell will have an exhibition of his Doctor Who art hosted by the Tea Tree Gully Library from the 17th to the 27th of July. While rumours about the date ABC will premiere Doctor Who series two have been rife, the official release to the press will be next Friday, the ninth of June 2006. Jack of all trades Doctor Who producer and script editor Peter Bryant passed away on the 19th of May. An obituary was printed in Thursday's Guardian, but reportedly did not mention his Who work. A time for reflection with the 20th anniversary of Robert Holmes' death on Saturday, and the tenth anniversary of the passing of Jon Pertwee on Wednesday. Rumours of Doctor Who's debut on ABC for 2006 have suggested the dates July 8th and August 5th. The head of programming has denied either of these dates is correct. ABC confirms they have lost the rights to the Daria feature Is it Fall Yet?, and have never held the rights to Is it College Yet? Anticipate a Daria drought following Boxing Daria airing on the 26th of May. Doctor Who has romped six wins at the Welsh award night for the British Academy of Film and Television. We are sorry to report the death of Robert Sloman in December 2005. His Doctor Who scripts were The Daemons (co-written with Barry Letts and credited as "Guy Leopold"), The Time Monster, The Green Death and Planet of the Spiders. You can read his obituary by Barry Letts here. The official Darren McGavin site reports the death of Darren McGavin on February 25th, 2006. He was 83. His contributions to science fiction include roles in The Martian Chronicles,Tales of Tomorrow and the title role in The Night Stalker. Andreas Katsulas, best known to science fiction audiences as ambassador G'Kar from Babylon 5, has passed away. According to his agent Donna Massetti, the cause of death was lung cancer. He was 59. An interview about the club appears in today's (Feb. 5th 2006) Independent Weekly. Henry McGee, best known for his role as Benny Hill's straight man has died at 77. He also protrayed the villainous Music Master/Nasty Person in The Goodies. Thanks to the generosity of member Anthony D., the club has now got a near complete run of Doctor Who on video. This includes rare black and white episodes from stories with missing parts. The New Horizons probe to Pluto, Charon and the Kuiper Belt has launched. ABC has reveled its plans for the current Doctor Who slot following the repeat season ending on February 3rd: magazine style programming. The Tennant episodes remain unscheduled. ABC has the rights to series two. The ABC have confirmed their schedule for the remaining Doctor Who repeats. As usual the ABC will broadcast the Hopman Cup tennis instead of Doctor Who for week one of 2006. David Tennant will portray the Doctor in a Children in Need charity appearance to be broadcast on November 18 in the UK. The BBC have announced a Doctor Who spin off, Torchwood. We will have a club table before the event tomorrow (3 PM start, pre-signing for those organised enough to bring in their memorabilia). Drop past and say hello! John Tulloch, author of Doctor Who: The Unfolding Text (the first academic work on the show) is recovering after being hurt in the London transport bombing. Hi, I've just got a letter from a long lost member - Chandler (nee Helen) writes from Lismore and says hi, how's it going. Her car made it but needs serious rest and recuperation. Chanlder is enjoying the new doctor immensely and is very glad they have stuck to the old format rather than americanising it. She is only in Lismore for a couple more weeks before moving on, she's chasing the sun but is finding it difficult to catch. Surfers is her next stop and is hoping to find someone tall, blond and handsome. End message. The much anticipated third season of Spooks screens from 9:25 PM, Friday July 2005. Galactic Video will be having a 10th Anniversary thing on this Saturday (25th June) and continuing Monday and Tuesday. I was particularly asked to pass on the message that anyone showing up in SF-related costume (preferably Doctor Who) on the Tuesday will get half price on video hire. In an unfortunate coincidence Ed Bishop and Michael Billington, stars of the Gerry Anderson live action series UFO, have both died. Following the BBC, CBC (Canada), TVPrime (New Zealand), the Australian Broadcasting Corporation and Canal Jimmy (Italy), Finland's national broadcaster Yle has purchased Doctor Who. Doctor Who exterminates the opposition! Rose has comprehensively won the 19:30 slot for May 21st, 2005. Less than one day after its general realese, Star Wars Episode III: Revenge of the Sith has alreaady been pirated and is available online. Actor Frank Gorshin, enjoyed at the recent club meeting in the AIP feature Invasion of the Saucer Men, has passed away on the 19th of May, 2005. Cited causes of death are "lung cancer, emphysema and pneumonia". Your secretary will be interviewed on Brisbane community station 4EB-FM for 13:00 Queensland time. The interviewer is Peter Rohl. Actor John Bennett passed away on April 11, 2005; aged 76. Bennett played General Finch in the Jon Pertwee serial "Invasion of the Dinosaurs," Li H'sen Chang, servant of the god Weng-Chiang, in "The Talons of Weng Chiang" opposite Tom Baker. He also appeared in "The Avengers", "Blakes 7", "The Saint", and several film roles, including "the 5th Element".